Batman is Batman. It’s hard to turn him down. Any movie, any game, and any comic that comes out with him attached immediately generates the interest of millions and brings new fans into the industry. However, when you have a character like that you tend to focus on quantity over quality. Even on projects that are targeted for a younger audience, you lose sight of the awesome characters within. This is the story, in short, of Batman Unlimited: Animal Instincts; an animated adventure targeted at kids that is very simple, boring, and far off from Batman cannon. The newest skyscraper of Gotham is near completion, and its owner, Oswald Cobblepot, is ready to put on a big show for the grand opening. With a high-caliber guest list, Cobblepot, aka The Penguin, introduces his new robotic army that is fully supported by a large list of villains that includes Cheetah, Killer Croc, Man-Bat, and Silver Back. With the help of Nightwing, Red Robin, Green Arrow, and the Flash, Batman sets out to put a stop to The Penguin’s diabolic plan to destroy Gotham City and get rich while doing so. Batman Unlimited: Animal Instincts is shallow and boring for adults but has entertainment value for its target audience; children. Bruce Wayne is fairly straight-laced and in typical Bruce Wayne fashion, but the characters around him are somewhat exaggerated. Flash’s goofing off is elevated to a new level making him seem like a child himself that just found out about his super power. Nightwing and Red Robin are constantly on the back and forth with witty one-liners to every character, especially the villains. In fact, the dialogue and development of the bad guys are the best parts of most of these characters. The Penguin is also a bit odd in this, and not to say that he isn’t always odd, but I felt incredibly annoyed every time he was on screen. The constant dialoguing between villains and heroes mixed with a predictable and all too obvious end to The Penguin’s plan plagues the movie even further. The story felt like it lacked any real depth, with every component floating right on the surface. This is not a terrible thing for something targeting a younger audience, but for myself I found it to be somewhat irritating and also a bit disrespectful to the Batman name. But I can’t say it was all bad. Some of my complaints would have been lessened if the showiness was just toned down. Red Robin could be funny at times, and any time you have Green Arrow and The Flash on screen together you do get some interesting moments. The rise and fall of Man-Bat added enough to keep this from being a completely one-dimensional plot and even added some interest to a character that is often overlooked. 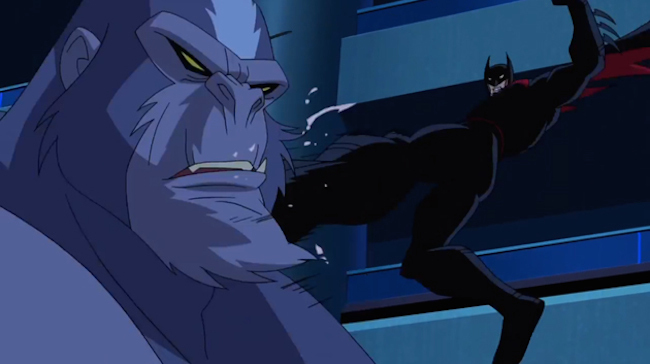 When I initially watched Batman Unlimited: Animal Instincts I was fairly unimpressed and felt let down. But when my two children sat down to view it, they found it entertaining and enjoyable. Knowing that they are the target audience, I wouldn’t be so quick to dismiss this title. 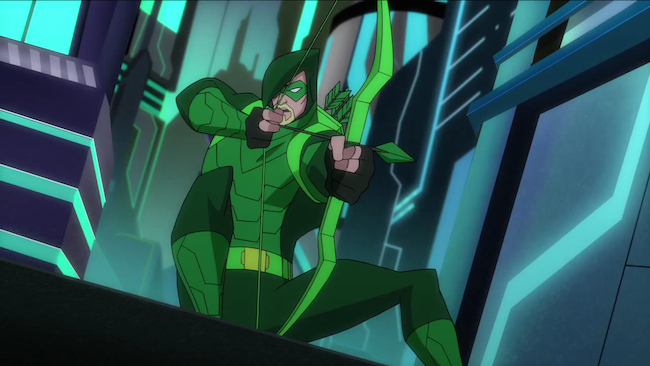 DC animated movies have typically been very strong when it comes to the high definition presentation. Even with that precursor, I didn’t know what to expect with Batman Unlimited: Animal Instincts because it isn’t a Warner Premiere title. The presentation ended up being very pleasant, with a strong audio track and a deep and vibrant video presentation. The Mpeg-4 1080p encode for Batman Unlimited: Animal Instincts has a bold color palette that lends itself well to a dark presentation. This isn’t the typical dark and gritty Gotham City, but more of a light-filled and fun downtown bustling with active people and futuristic vehicles. The presentation supports that look and feel throughout the movie. The image often has depth to it and the fast paced action avoids any types of microbanding, common in two-dimensional animation early in the Blu-ray game. Overall, the video presentation on Batman Unlimited: Animal Instincts isn’t something to be very excited for, but for a straight to home video movie targeted at kids, you can expect to find yourself impressed. The audio falls in that same boat. The DTS-HD Master Audio 5.1 track is good enough to do exactly what one would hope for in a movie like Batman Unlimited: Animal Instincts. The dialogue is clear throughout, with the many sound effects never interfering with conversations that both drive the plot and try to entertain. Those same sound effects do get a fair treatment from all the remaining speakers and subwoofer, with just the right amount of bass coming through to drive home the action. Again, this isn’t something we’re handing awards out to, but it’s a strong outing on the audio side of things. Batman Unlimited: Animal Instincts comes with the typical slate of DC animated extra features. 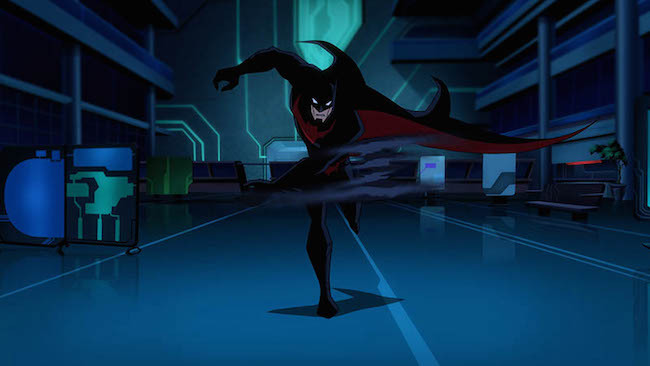 This is not a bad thing, as fans will be treated to an extensive featurette and plenty of animated shorts and episodes from other awesome DC animated series. As a die-hard Batman fan I rarely dismiss anything that features the Dark Knight. But Batman Unlimited: Animal Instincts just wasn’t for me. As noted above, the movie does hit well with the target audience, or at least it did in my house. Mix that with solid video and audio presentations as well as some interesting extra features, and you have yourself a low-priced Blu-ray that fans should definitely pick-up.